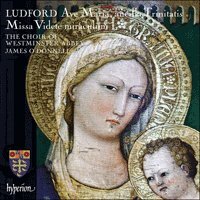 Nicholas Ludford (c. 1490–1557) is back, soon after we heard one of his Lady Masses (Fanfare 41:4), with a new recording of the Mass that first introduced him to the record catalog, one of four Masses recorded by Andrew Carwood (17:4). The abbey choir does not duplicate Carwood’s liturgical reconstruction of a feast day Mass that includes the chant Propers of the feast (Purification, February 2) and the Vespers responsory for that feast from which the cantus firmus of the Mass was taken. Instead, O’Donnell fills out the disc with four selections. The votive antiphon Ave Maria, ancilla Trinitatis was on Carwood’s final disc (18:4). The other three fillers are first recordings, each a movement from two of the Lady Masses. With the abbey choir, O’Donnell has recorded music of the Tudor era before (32:3). That disc was followed by a pair of Masses of Christopher Tye (36:1) and a pair by John Taverner (40:2). His achievement in bringing the abbey choir to the highest level it has reached in modern times is evidenced by this sequence of recordings, from his appointment in 1999 to his first recordings in 2005 and the three discs of Tye, Taverner, and now Ludford. In this Mass for six voices, the choral sound is warm and brilliant, and it is enhanced by the acoustics of All Hallows, Gospel Oak, the site of his recent recordings, where the engineers have an easier time of it than in the abbey church. The trebles (singing two of the six parts of the Mass) are marvelous, and the men blend with them faultlessly. There are few solo opportunities in this program, but the verse of the Alleluia, ora pro nobis and the Mass intonations are exquisite. There is room for two contrasting versions of this Mass, for Carwood uses a large adult mixed vocal ensemble, and his programming around the Mass is an alternative to this collection of Ludford’s music. In any case, the ASV Gaudeamus label is long gone, unfortunately. O’Donnell’s tempos in each movement are a shade faster than Carwood’s, not enough to make a difference. The ninefold Kyrie (from the Lady Mass for Tuesday) is sung in the even invocations; the organ alternates in the rest. The alleluia verse is from the same Mass, while Hac clara die turma is the sequence from the Thursday Lady Mass. The tracking is generous. The ninefold Kyrie has separate tracks, Hac clara die turma has eight tracks for its six minutes, and the five movements of the Mass each have several tracks, as do the other two selections. Ludford is certainly coming into his own after the neglect occasioned perhaps by the disappearance of St. Stephen’s Chapel in Westminster, where he was formally employed from 1527. The chapel was turned into the home of the House of Commons until it burnt in 1844. Unlike other composers, whose memory was kept alive by the institutions where they served, e.g., Taverner at Christ Church Cathedral, Oxford, Ludford was orphaned by the disappearance of his chapel. But Westminster Abbey is a stone’s throw from the site, as proper an institution as any to keep Ludford’s memory alive. We are not done, for while Carwood has recorded the four complete festal Masses and Scott Metcalfe has recorded two of the three incomplete Masses from the Peterhouse partbooks, we have only one of the seven Lady Masses recorded complete (besides parts of several others). Tudor composers have been treated very well by British ensembles, so we may hope for the rest. Meanwhile, if you have Carwood’s recordings, this marvelous disc will complement them nicely, and if you don’t, you will now have a chance to hear this magnificent choir in music that should belong to them.